$18.89 $18.91	Get Your Stuff! 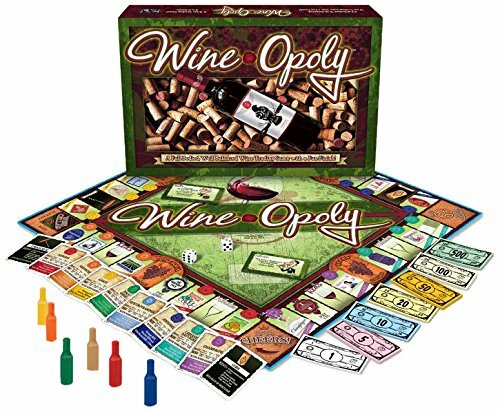 In this variant of Monopoly, players buy favorite wines, collect bunches of grapes, and trade them in for decanters. While a fun game in it’s own right, it will also teach you about wines as you play. The back of each deed contains wine descriptors and fun facts about each wine. There are other touches like, instead of Chance and Community Chest, you draw White or Red Wine cards. Oh, and instead of going to jail, you might end up in the Wine Cellar until you’re properly aged–then you’re out of the game for three turns. It’s a great game for your fellow wine-lovers or people who just want to know more about wine. I’m also pretty certain you could make a drinking game out of it, if you are so inclined. It’s almost as if the whole theme of the game is calling for it. So choose your token (wine bottle, cork, wine glass, cheese, grapes, or carafe) and advance to Cheers to start your first game of Wine-Opoly. Dimensions: 15.4 x 10.6 x 2.1 inches. Like the classic property game, but with a wine theme. Learn facts about wine while you play. Instead of Jail, You go to the “Wine Cellar” until you’re properly aged.